DESCRIPTION: Our new Jump N Splash line is now available. It is one of our many new and innovative Wet Bounce Combos that addresses the problem of the bounce area getting too slippery once it gets wet. When water gets on the vinyl it causes the kids to slip and lose their balance with serious injuries a real possibility. 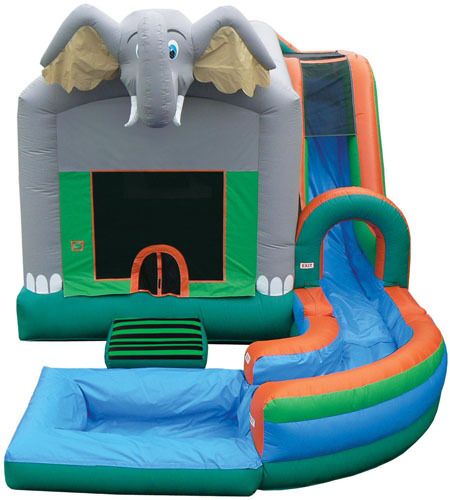 Big Air Jumpers offers the first and truly safe Wet Bounce Combos. We have incorporated specially built heavy duty non-skid material on the entrance ramp and on the entire jumping mattress virtually preventing the kids from slipping. The 15 x 10 bounce area has a basketball hoop and drainage system built in. Comes with a misting system that connects to a standard garden hose. Garden hose and water not supplied by Big Air Jumpers.